This versatile style and consumer favorite is made from brown leather and is perfect for Spring and Summer play. They're soft and sooo flexible. My grandson is one year old. After trial and error on my part I found the right size. I know they are suppose to have extra room in the toe. But the 12-18 month old were a little to long for him. The 6-12 month were perfect for him. Use the robeez size chart. Shoe for the Baby who refuses shoes! My son's daycare requires shoes for babies who are early walkers. My son hated (red-face screaming, crying, refused to stand up kind of hated) all the shoes we tried! I tried soft soles, slippers, sandals, everything. I got these shoes as a last resort after 2 weeks of trying other shoes. He fussed when I first put them on, but no crying. He stood and took a few (rather awkward) steps and sat and cried for a few seconds (not like with the other kinds of shoes) then stood and walked some more. He repeated this a few times, walking then some cries, but after a few times he was up and walking and hasn't stopped since! These are going to be the only shoes I buy from now on! My son has big feet. He is a 16 mos old wearing 2T , size 7-8 in shoes now. I am alway hesitant to buy online because of how the true fit might be but these are amazing. I bought them way ahead of time maybe in Aug last year so he started wearing in Nov but they were perfect fit. I love how soft the soles are to walk inside our house, because our floor can tend to be cold so sometype of thin sole is best adn thisare so soft fit like a glove and we all love them. THEY ARE ALSO COMPACT! haha so we can fit them anywhere purse, wallet they can fold very welll hehe. He is now wearing size 7-8 and this pair was a 6.5 i believe so it is getting pretty tight but still fits. I woudl say this type of shoes might ran maybe a quarter of a size bigger unlike pedipeds which i bought hinm a couple they run very small on the size and i have to say Robeez for my son have worked better than pedipeds. He has soem stride rite now to go to daycare but these are our to go shoes when he is not in daycare. I am actually goign to purchase more of the soft soles in bigger sizes bc we just love them! I have twin boys that are 13 months. Ordered size 12-18 months and they were huge for the boys! AfterI ordered them, I learned that Robeez doesn't offer free shipping back to exchange, nor do they exchange. We had to return them, losing any discounts or promo codes that we had, and reorder a smaller size. 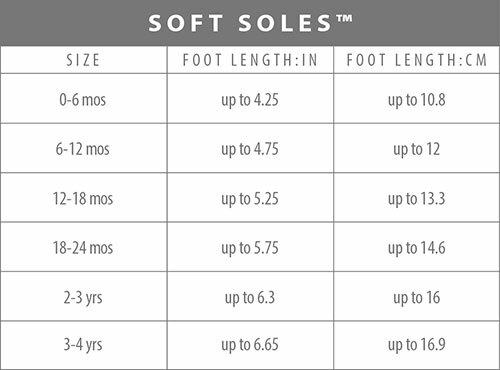 Make sure when you order shoes for your babies that you print out their size chart and measure your babies feet to save hassle on returns and exchanges.